The advances we’ve made in technology, and especially in mobile apps, over the last decade have been huge. Before we relied solely on searching for information in books, asking our colleagues to share experiential knowledge, or using analog and more time-consuming methods to gather information. Now using mobile devices, we have unfathomable amounts of information, literally at our fingertips. This wealth of resources can be a bit overwhelming for those of us trying to understand which app is the best to track our habits, make a to-do or shopping list, or navigate to an unfamiliar place. While there are countless apps to help us do countless things, there are a few that make working in the field a little bit easier. These apps don’t replace solid analog tools or a good chat with an experienced colleague, but if you are working alone and you need some quick information, there are a few apps that can help you out. Sun Seeker is an app that uses augmented reality to show the user how many hours of sunlight an area receives throughout the year. This app is a solid replacement for the analog solar pathfinder. Simply stand in the spot you are analyzing and, using the 3D View tool, hold your device up and move it in the direction of the sun’s path. You’ll see fours lines that show the sun’s path across the sky specific to the position you are standing in. The blue line depicts the sun’s path at the winter solstice, the green line shows the spring and fall equinoxes, the red line shows the summer solstice, and the yellow line marks where the sun is today. 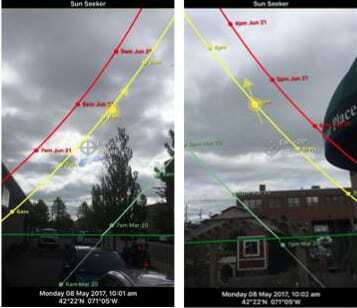 Using your device’s camera, this app shows exactly when the sun comes out from behind a building, or when it ducks behind the trees. Because each line has dots that mark the hours of the day, you can pretty accurately measure how many hours of sunlight each spot will receive. The only downside to this app is that the augmented reality is a bit glitchy in dense urban areas where reception is poor. 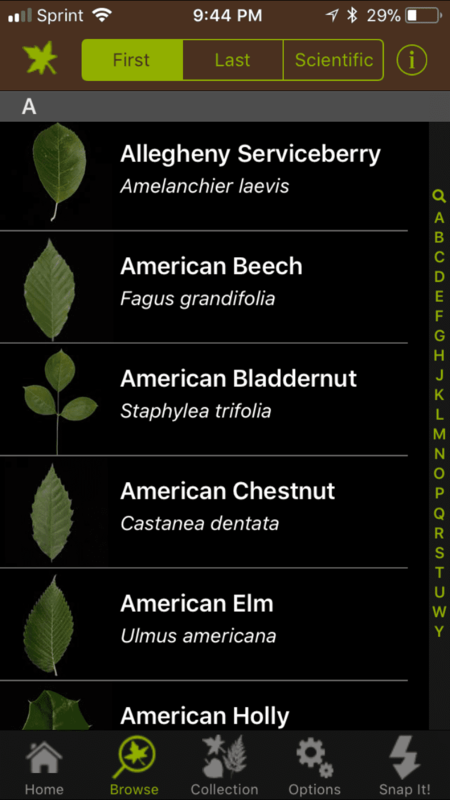 Leaf Snap is an app designed for tree identification enthusiasts. The main idea behind the app is that you can take a picture of a leaf (as the name suggests), and the app will cross reference the photo with the information in its database and tell you what kind of tree you are looking at. This is a nice idea, but I find this feature to be only generally accurate, and the process to be a bit clunky. In order for Leaf Snap to work, you need to take a picture of the leaf on a white background, and then you need to have enough cellular service to upload the photo. Even though the app doesn’t always correctly match the leaf to the tree, it does often point you in the right direction. What I really like about this app is the number of pictures associated with each tree. Most trees have seven to ten photos showing the leaf shape, flower, fruit, petiole, and bark. It’s not quite as helpful as a dichotomous key, but it is a great resource for tree photos. This is my go-to weather-forecasting app. When I want to know what the short and long-range weather forecast is, the weather underground is my guide. Dark Sky sends pretty accurate alerts that indicate when rain will begin or end in your area. It has a simple and sleek interface that I find attractive. NOAA Radar is useful to look at the regional precipitation events to help anticipate when a storm will move through the area. SoilWeb uses GPS-based data and the NRCS soil database to give you information about the soil characteristics in your specific location. 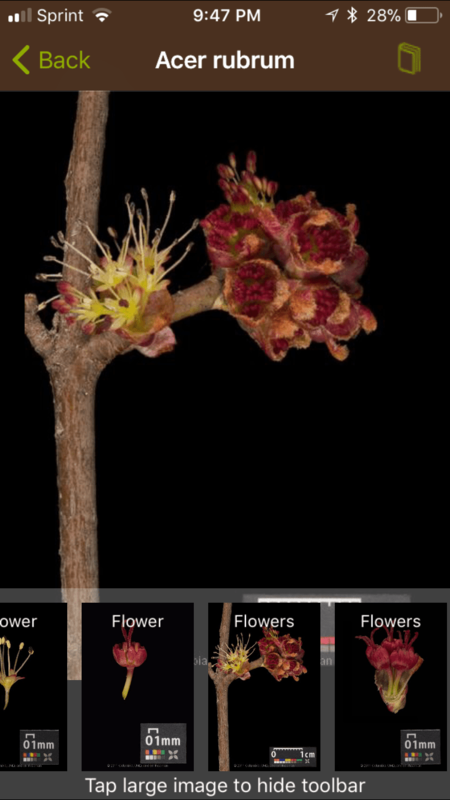 DirrGuide is a plant identification app based on the information in Michael Dirr’s Encyclopedia of Trees and Shrubs. TreeID? is produced by the Arbor Day Foundation and uses a dichotomous key to help the user identify a tree. GoBotany, though not yet a mobile app, is a website offering identification keys to over 3,000 plants. It’s a great general resource and the website is mobile friendly. While apps and mobile devices have their limitations, they can also make our lives a little easier and our work more efficient. What are you favorite apps that you rely on in your work? Rie Macchiarolo works as a landscape designer for Somerville-based urban farming company, Green City Growers. Rie works with clients to understand and realize the growing potential of each site and designs edible landscapes incorporating vegetables, perennials, and native plants. Rie earned a Masters of Science in Ecological Design from the Conway School and serves on the ELA Board of Directors.